One thing I like about returning to NZ from places like China, is being around nature again. We live in one of the few parts of the world, and certainly the developed world, where wildlife is sometimes not just at our doorsteps, but also inside as well. Some of this is down to our urban forests. Our urban forests are often underappreciated. They’re fragmentary and disturbed places. Forestry- both the conservation and the production side- has typically been directed at large forests well outside the urban fringe. And areas big enough to do serious conservation, like save endangered birds. Urban forestry is a kind of fringe thing. And it’s not easy challenging the perception that urban forests are kind of messy parks. Urban forests though provide a lot services. Not only does this buffering areas from the worst of heavy rainfalls and pollution absorption, they also sustain some of our smallest native wildlife. Many people will be aware of the tui, and some will be fortunate enough to have kereru about. Despite the very disturbed human environments of our cities, a number of native bird species do live here. Then there’s the secret wildlife. The hidden wildlife. The wildlife that likes to stay in the dark of our forests, that comes out at night. There is a wide range of arthropods and the like, that are hanging on (or even thriving) in our little patches of forests and our gardens. They’re easily overlooked. Sometimes they come to people’s attention when they wonder into houses. 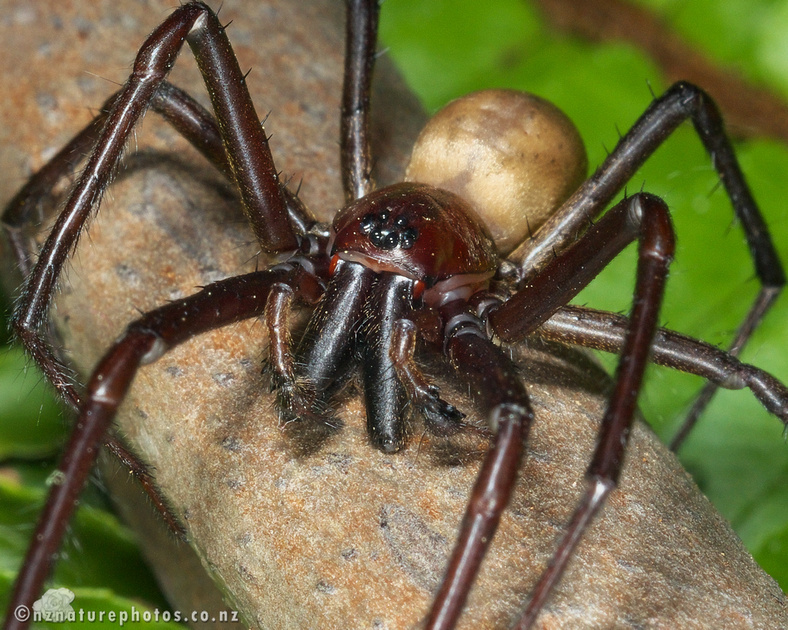 The male Cambridgea foliata (below) is one common household invader in Auckland. But rather than being a threat, he’s put looking for mates before he dies. 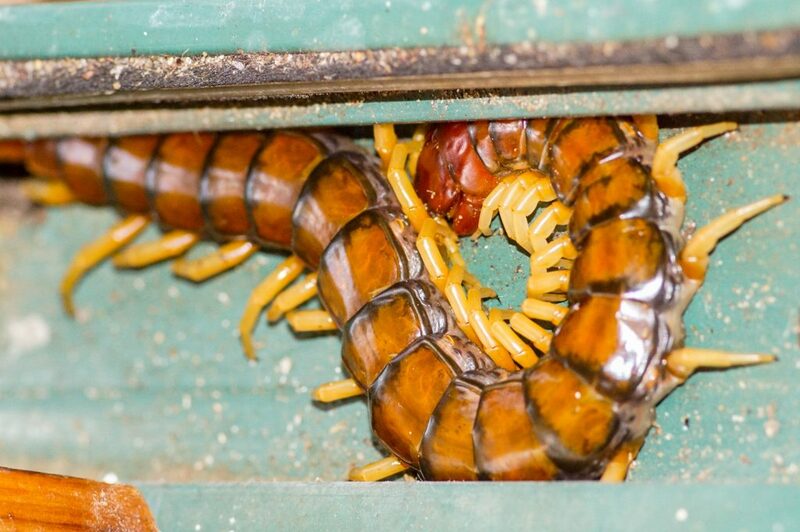 Another rarer creature is the giant centipede Cormocephalus rubriceps. We found it in the weekend, huddled in the bottom-sill of the front door. It had squeezed up through the drain hole in the aluminium. This creature can grow up to 16cm long (some report 25cm). I have rarely seen these outside of bush-settings. The problem is they are large, too large. Hiding from rats is a challenge for them. After general cries of delight from the members of the household*, I evicted it during the night. I can add that giant centipedes make a very cool clickety-clickety sound as they run across cobblestones. Which comes back to the threats to our native arthropods. While globally we are undergoing a biodiversity crisis, where in Europe people are reporting the collapse of insect populations, we have some remarkable native animals still on our doorsteps (or as I’ve just shown, right in the door). The threats to our largest arthropods includes rats, which eat them. Invasive wasps are also a major predator of our native insects. These range from the aggressive Vespid wasps (like the German) and paper wasps. Aggressive rat and wasp control is an important part of sustaining our native arthropods. That’s in part why I have rat bait stations both inside and outside the house. And that’s why populations of vulnerable native creatures can be sustained in our cities. Keeping the rat populations down in our urban forests and where they connect to our houses, is a conservation action we can all do. Maintaining our urban forests is crucial. And please keep killing those rats and wasps folks. * I’m not actually joking. Much of the fear about our creepy-crawlies is taught. It’s not grounded in any good evidence. Appreciating what we have is just a matter of tapping in to our natural curiousity at a young age.